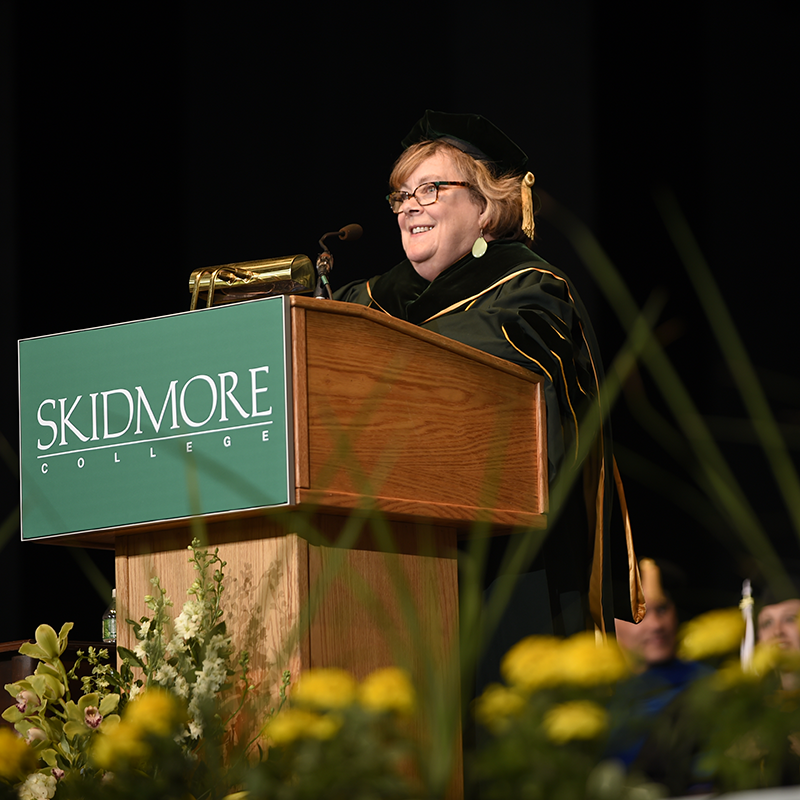 On May 20, Skidmore congratulated 624 creative graduates at the 106th Commencement Exercises. 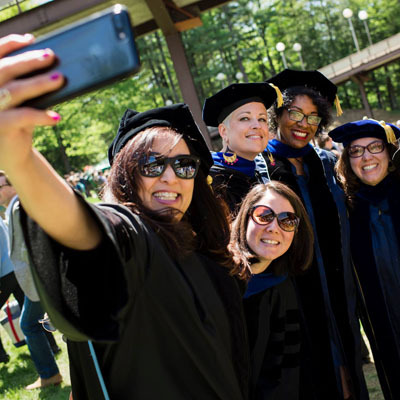 The Class of 2017 heard remarks from distinguished honorary degree recipients—philanthropist, producer, and actress Oprah Winfrey; author and youth advocate Wes Moore; and educational founder and philanthropist Ann Tisch—as well as a faculty farewell from Skidmore business professor Mark Youndt and words of wisdom from President Philip A. Glotzbach, alumni association president Sibyl Waterman Haley '71, and senior class president Madison Plummer '17. 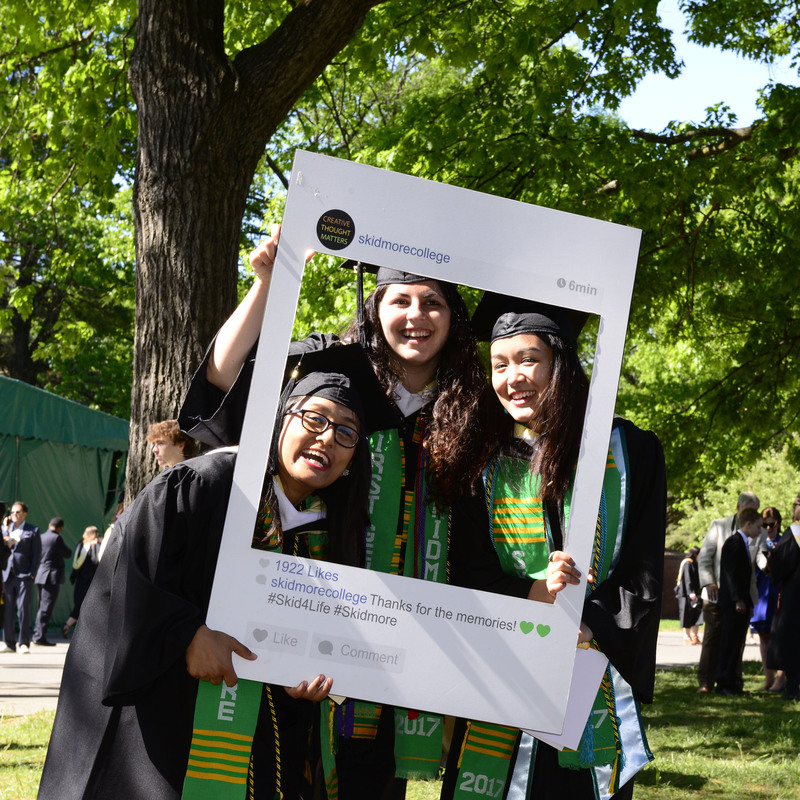 The class of 2017 spent the day celebrating, recording memories, and reflecting on their time at Skidmore as they prepare to leave campus. 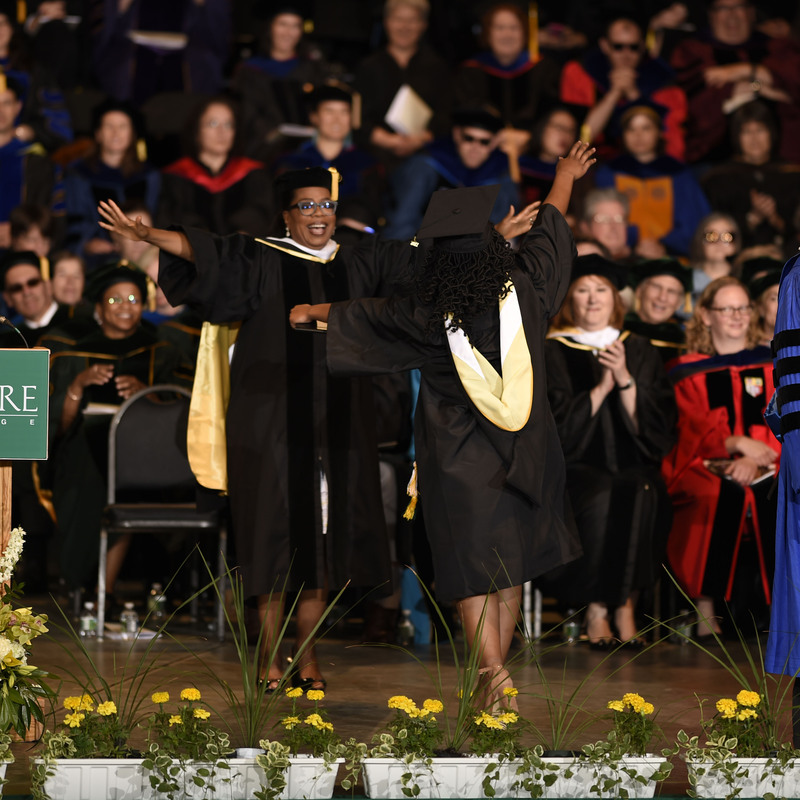 Awarded a doctorate of letters, Oprah Winfrey was introduced by Tim Harper, professor of management and business, who reflected on her impressive career as a global media icon and education advocate. 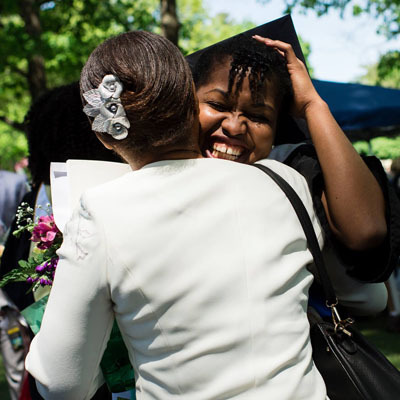 Winfrey was invited to celebrate her "daughter" Mohau Mazibuko, a graduate of the Oprah Winfrey Leadership Academy for Girls and a member of Skidmore's Class of 2017. "I want to talk about my dream for you," she said. "Being able to make the right choice based on the truth that is you—that is the dream and hope that I have for you today." 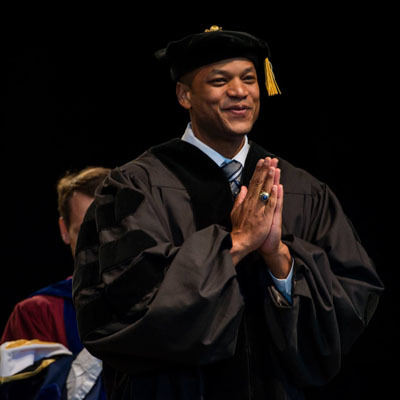 Awarded a degree of doctor of letters, author, activist, and scholar Wes Moore was introduced by Janet Casey, English professor and director of the First-Year Experience. 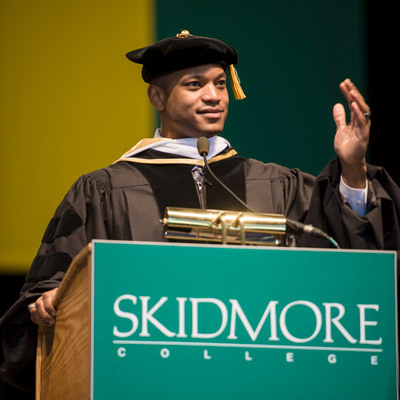 Moore, whose novel The Other Wes Moore was the assigned reading for the graduating class when they were first-years, began by asking graduates their major. "That's the last time anyone will ask you that," he said. 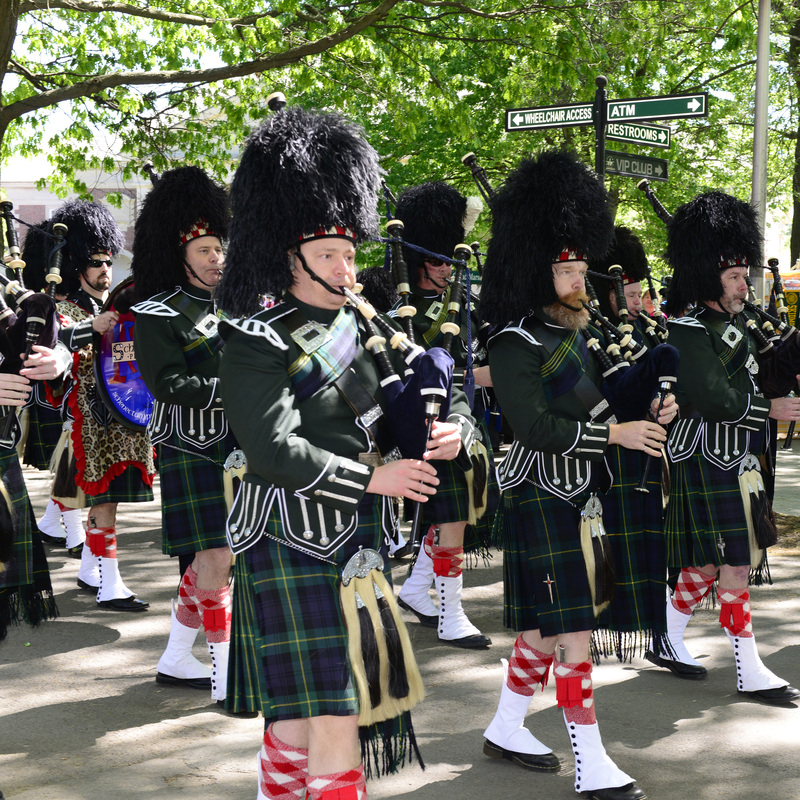 "The question of what you majored in will fade; the question of what you stand for will not." 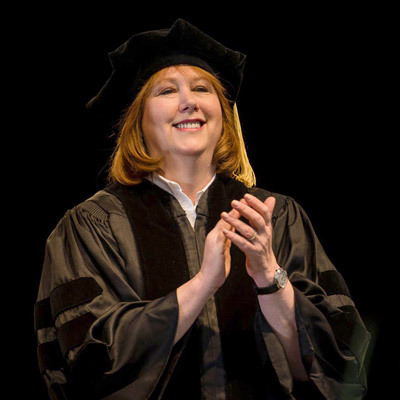 Awarded a doctorate of letters, journalist and education advocate Ann Tisch was introduced by Hope Casto, associate professor and chair of education studies, who noted Tisch's work with the Young Women's Leadership Network (YWLN.) 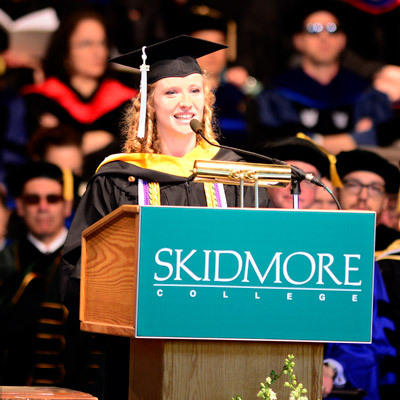 Tisch recognized four Skidmore graduates from the Young Women's Leadership Network and three from her CollegeBound Initiative. "Over and over people say they learned much more from their failures than their accomplishments," she said. "Learn to redefine failure as part of your success." 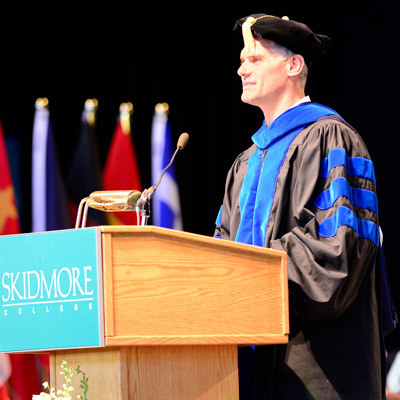 Selected by the graduating class as its faculty speaker, business professor Mark Youndt, who described himself as a "bookend professor"—one who teaches mostly first-year students and seniors—urged all students to make the most of their Skidmore experience and future journeys. 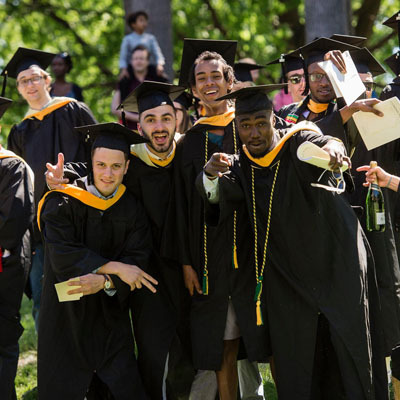 He left graduating seniors with an inspiring quote from Pulitzer Prize–winning poet Gary Snyder: "Stay together, learn the flowers, go light." 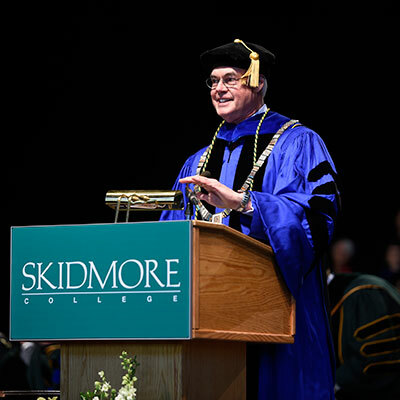 Skidmore College President Philip A. Glotzbach welcomed and congratulated the class. 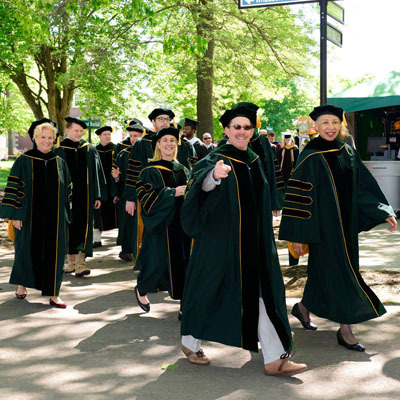 He noted that their gowns were made of recycled material, reaffirming the College's commitment to sustainability. 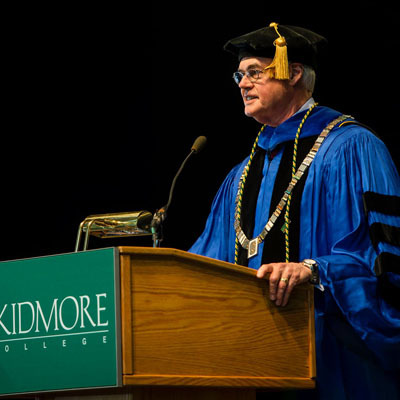 He called the graduates "lifelong ambassadors of Skidmore" and urged the class to "carry this flag of a liberal arts education." 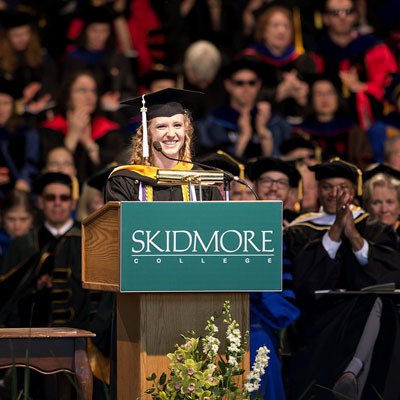 Glotzbach emphasized the strong ties of the Skidmore community, saying that the graduates should be proud "to stand with Skidmore alumni" and to hold on to that lifelong connection. 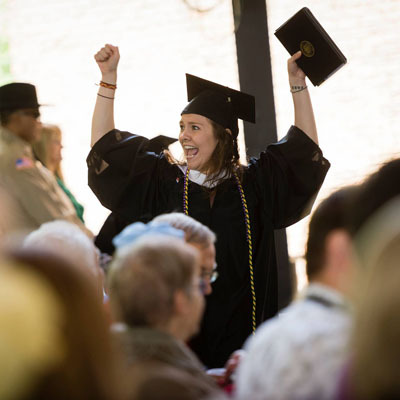 Lueckheide, who will attend Brown University this fall as a chemistry Ph.D. candidate, shared results from the Senior Gift campaign: 94.4% of seniors contributed a total of $5,200, breaking an 11-year participation record. 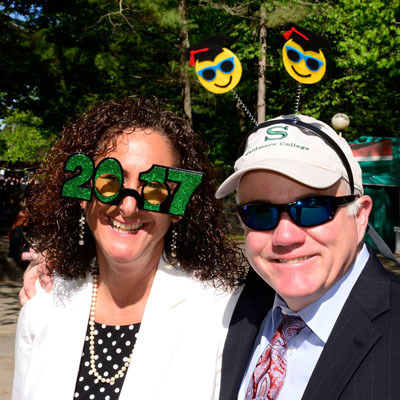 As a result, the sum was matched by alumna and parent Carol Strickland '72 in honor of her daughter Ashley Strickland '06. 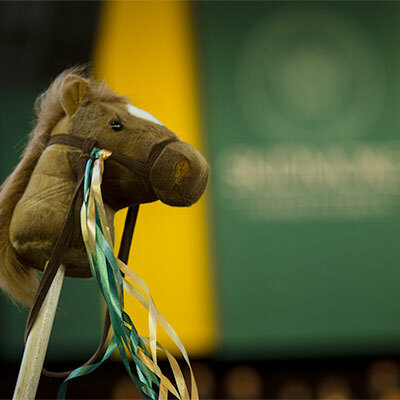 With the matching funds, this year's Senior Gift total comes to $10,400. 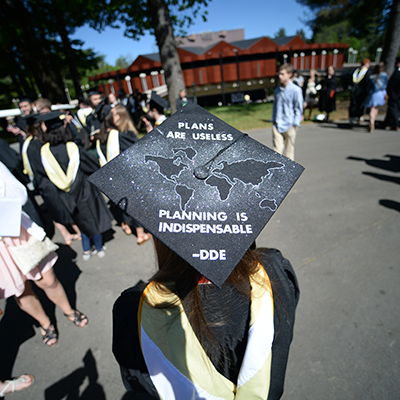 "Let's show the world that the Skidmore Class of 2017 does not believe in the word 'impossible!'" said Lueckheide. 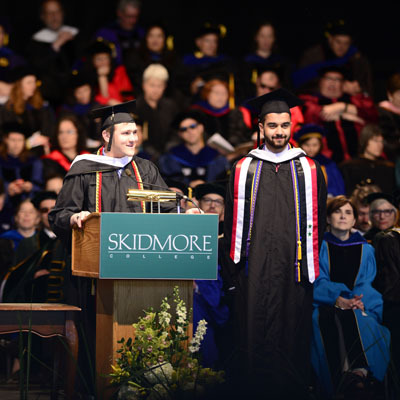 Al-Asaad reflected on his memories at Skidmore and encouraged the class to give back. 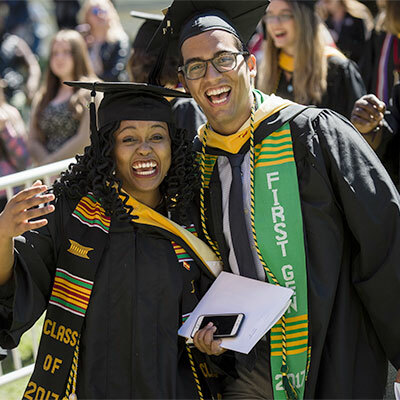 The graduates also gave to support scholarships, financial aid, sustainability, and athletics. 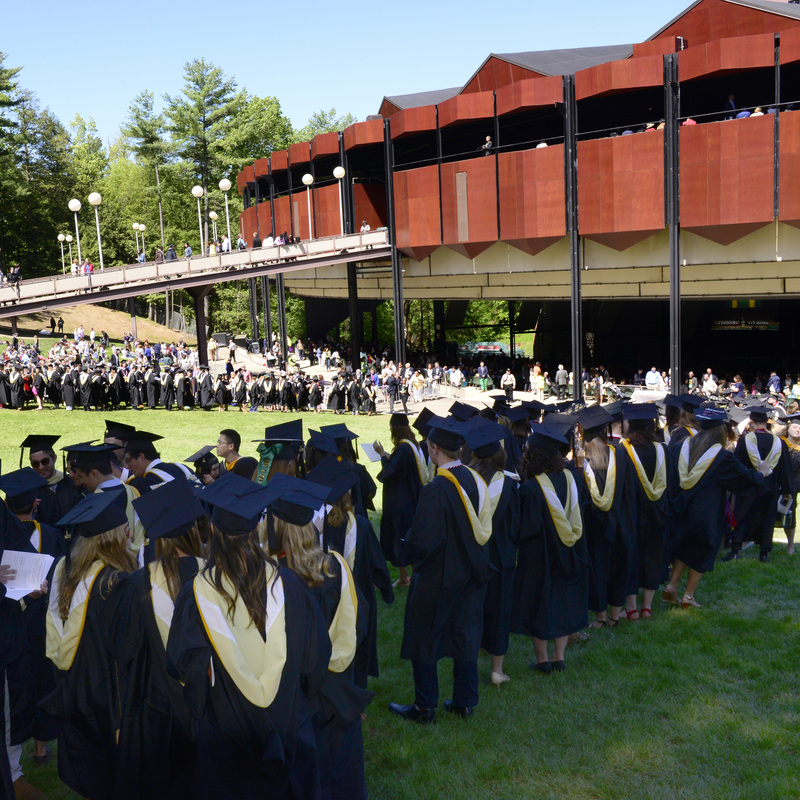 At the ceremony, attendees also heard from Scott McGraw, Skidmore trustee chair, and Sibyl Waterman Haley '71, president of the Alumni Association. 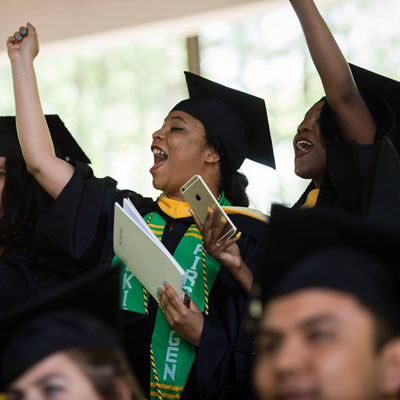 In welcoming the new class of graduates, President Glotzbach conveyed hope that the "critical and creative education" bestowed upon the class of 2017 will equip them well for the future. He shared the unique attributes of the class, noting that their robes were made of recyled material, and urged that in the current political climate, it is important now more than ever to stand with each other. 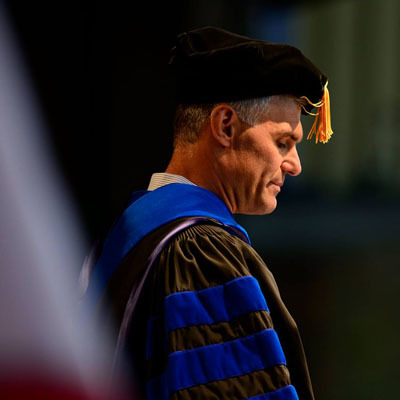 McGraw extended the trustees' congratulations and urged the graduates, "Be truthful with yourself...and you will shape the world in a very real way." 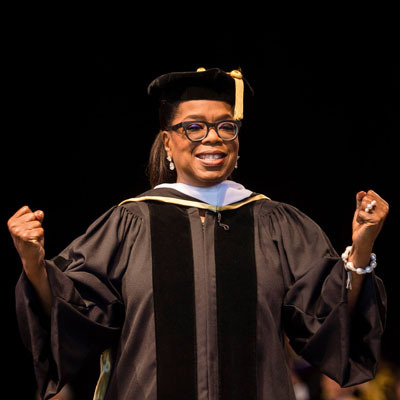 The College awarded three honorary degrees to Oprah Winfrey, Ann Tisch, and Wes Moore. 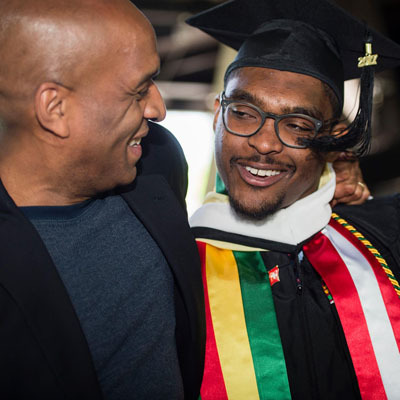 Professor Tim Harper introduced Winfrey as "a powerful black leader and role model....and yet because of your authenticity, you are known as simply 'Mama Oprah,' and today you are honored in particular because of one of our great graduates." 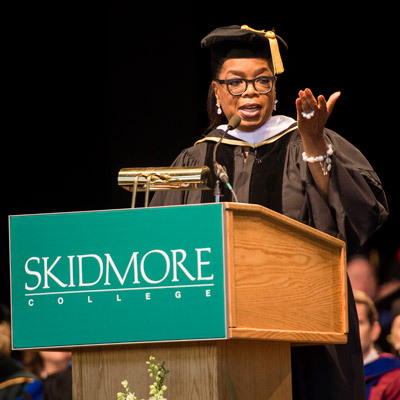 Winfrey recognized Mohau Mazibuko, who came to Skidmore from the Oprah Winfrey Leadership Academy for Girls in South Africa. 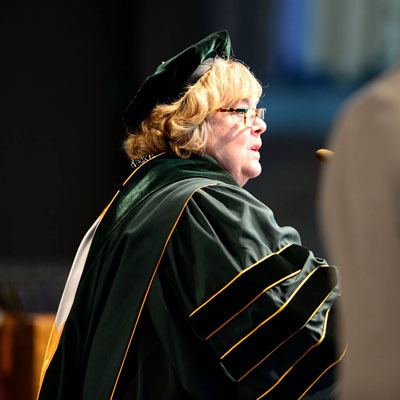 "There is nothing more powerful than you using your personality to serve the calling of your soul," she told the class. "Your real job is to know the truth." 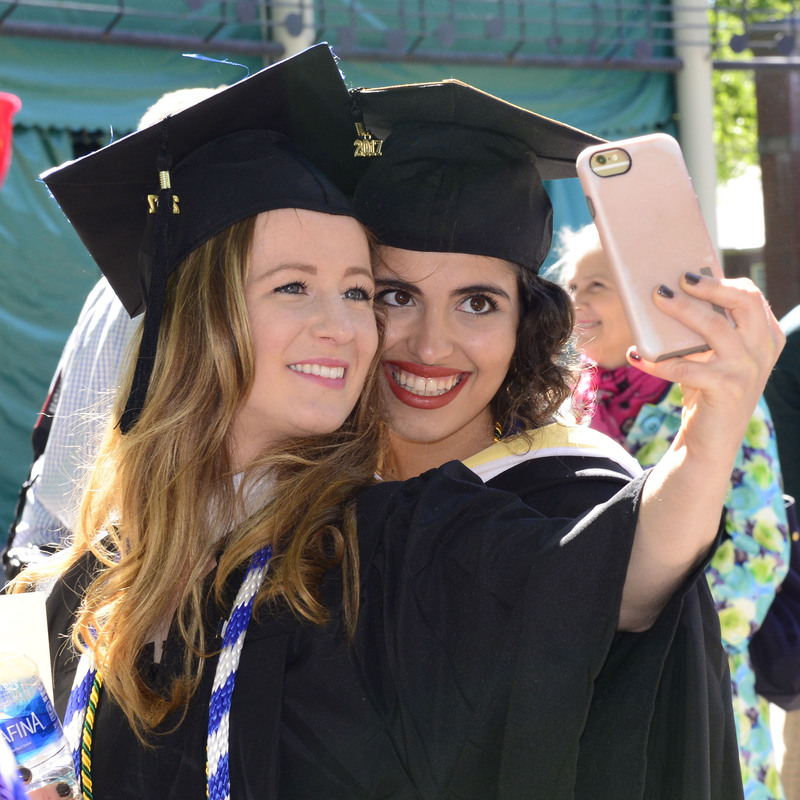 Education advocate and founder of the Young Women's Leadership Network and the CollegeBound Initiative, Ann Tisch recognized seven members of the Class of 2017 who are products of these programs. 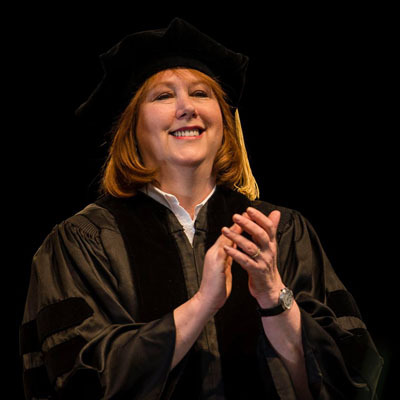 She emphasized learning from failure and urged graduates to be prepared for "challenges, dead ends, failures, and veering off-course... The best way to deal with trying times is to recognize them as invitations to think," she said. Author Wes Moore reflected on the "fact that our society is full of 'others' who right now need and deserve a champion." He added, "Because of what you've accomplished and the hard work you've put in, people will take what you say seriously simply because you said it. Simply because of the weight that your degree and your accomplishments bring. Use the hashtag #Skid4Life to connect.